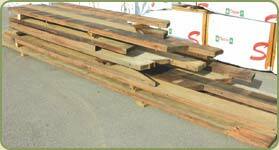 Bear Creek Lumber sells reclaimed and recycled lumber in many species. Products available are: Framing lumber, Hardwood flooring, Cedar siding, Interior paneling, Fir flooring, Redwood siding, Timbers/Beams, Shakes and shingles, Decking, and Trim. Pictured below: some of the 60,000 board feet of timbers from the Marshall Wells department store/warehouse formally located in Portland, Oregon. This building was built in 1915. 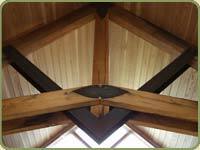 The timbers were from the era of old growth forests. This is all Douglas fir. It ranges in size from 25x25 to 6x11, including 6 x 22, 8 x 21, 11 x 19, 16 x 20, 25 x 25. Lengths are 6' to 18'. This material can be manufactured into other products such as paneling and flooring. 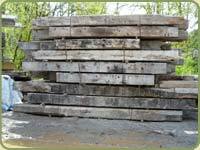 Reclaimed materials are also part of the overall recycling potential of wood products which don’t have to be thrown in a dump. Instead they can be reborn into new projects where their beauty can be appreciated over, and over. Pictured here at right is some Redwood from a watertank which used to serve as the water storage tank for a town in the Alaskan Aleutians. This material is old growth, clear all heart including vertical grain. The majority of the 15,000 board feet is 3x6. This served as the walls. It also contains some 3x10, 4x8 and 6x6 all heart which were the floor, joists and posts. This material can also be remanufactured into other products. 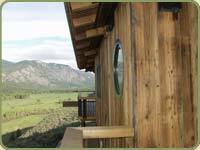 Designer Doug Potter utilized extensively reclaimed wood products in this valley view home near Mazama, WA. 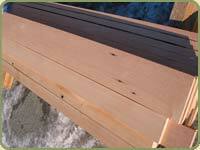 Douglas Fir was chosen for siding and some posts and beams, and wester red cedar timbers were also included. Visit the Photo Gallery. 1. The reclaimed wood arrives at our yard and gets sorted. 2. 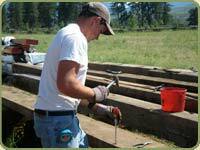 We carefully remove any old nails or screws. 3. 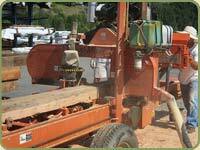 The wood gets milled into any product you may request. 4. The final product, in this case boards. Click on any of these images to see a larger view.